Feeling stuck on how to take your photos to the next level? ​Want a portfolio and website review? Do you want to learn how ISO, Aperture, and Shutter Speed work on your DSLR to shoot in manual mode? Need help with posing? There will be a model included (individual or couple, depending on your preference). Want to learn depth of field and how it can improve your images, making them no longer flat? Need help learning how to find the best lighting for your portrait sessions? "I started with an entry level DSLR camera and had no idea what I was doing. 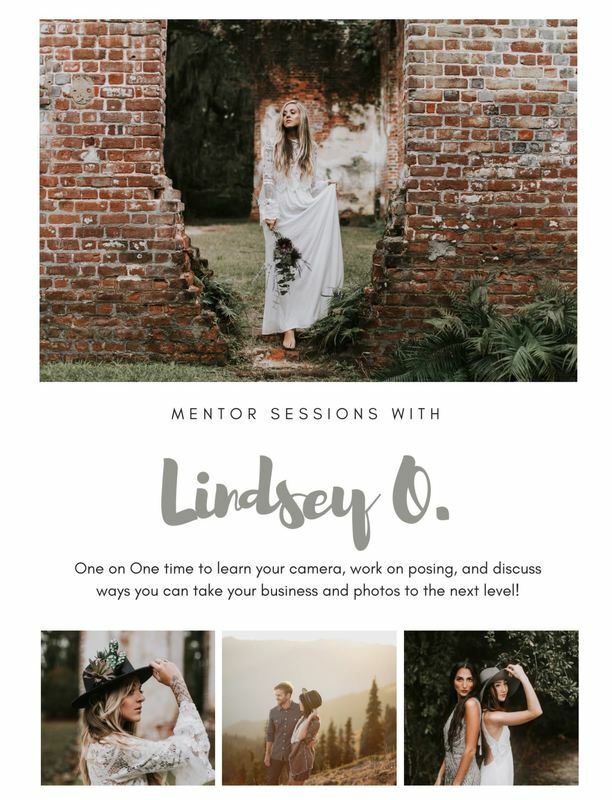 But after working with Lindsey she's taught me so many things that I've built enough skill and confidence to purchase prosumer gear and really take my photography to the next level!" "Time with Lindsey is well spent. It's rare to find someone who is so talented yet still humble. Lindsey makes learning photography care free, while creating visual works of art. Through her guidance she has taught me to not just take pictures, but to anticipate and capture the client's special moments."